A rainy Sunday indoors inspired a bit of renewed terrari-mania yesterday afternoon. After a morning walk through the misty garden —gathering moss and partridgeberry between raindrops— I set to work refreshing my collection of apothecary jars and wardian cases; pruning back overgrown foliage in the maturing containers and creating a few new vignettes to enjoy at my desk and dinner table. When it comes to indoor gardening, terrariums are as easy as house plants can get! 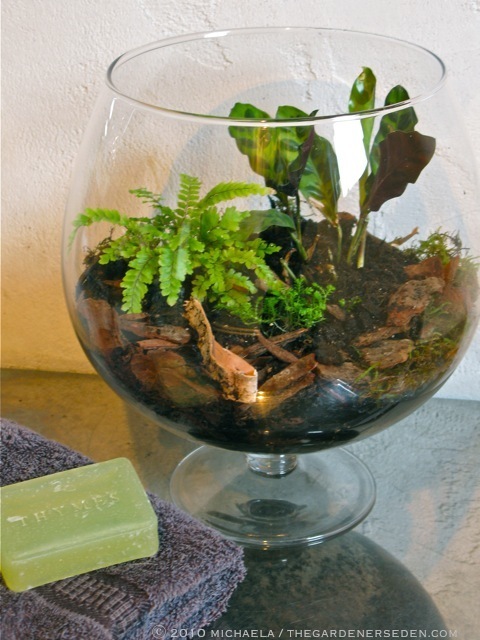 Interested in creating a basic, low-maintenance terrarium for your home, dorm, school or office? Planting a miniature garden beneath glass is a great rainy-day project; especially good for entertaining a group of restless kids. 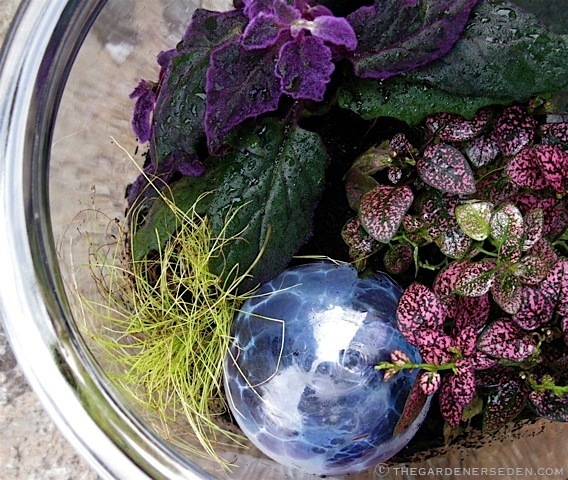 Click here to find my previous tutorial post with a step-by-step guide to basic terrarium building and visit the Indoor Eden page for more advanced terrarium ideas and other projects by clicking here. While tending my miniature gardens beneath glass yesterday, I also took time to gaze upon some of the new, online offerings from favorite terrarium supplier, Terrain. Oh what lovely, lovely things have made my wish list for the indoor garden this year. Aren’t these beautiful wardian cases, apothecary jars, glass bubbles and cloches tempting? I simply can not resist adding just a few more terrariums to my collection! 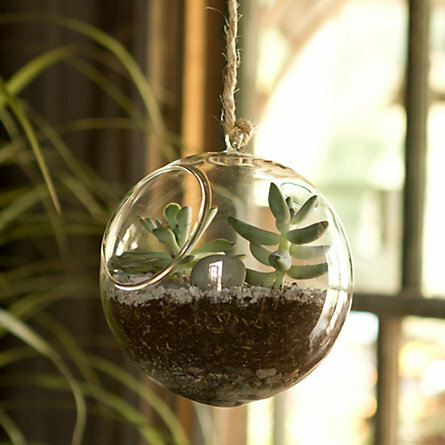 I’m also trying one of Terrain’s Hanging Orb Terrarium. I’m thinking –filled with some low maintenance flora– these might make unusual holiday gifts for my apartment dwelling friends. 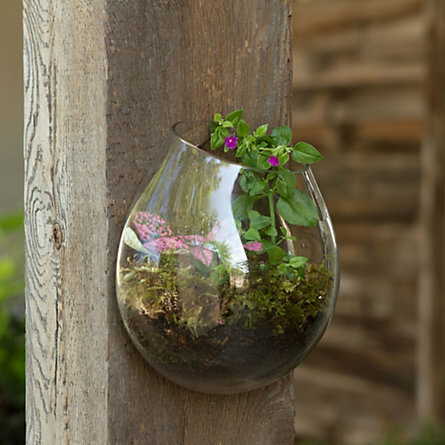 I also love this Recycled Glass, Wall-Mount Terrarium from Terrain. I think it would work beautifully in a tight space –like a powder room or tiny office– to bring a bit of nature’s beauty indoors. There are many, many more gorgeous terrarium containers available on the Terrain website (click here). This beautiful Wardian case is from H.Potter. I rotate plants each season to create table-top displays for my desk or dining room table. Above, the wardian case is pictured with Begonia ‘Tangalooma’ and Nephrolepsis cordifolia ‘Duffi’. 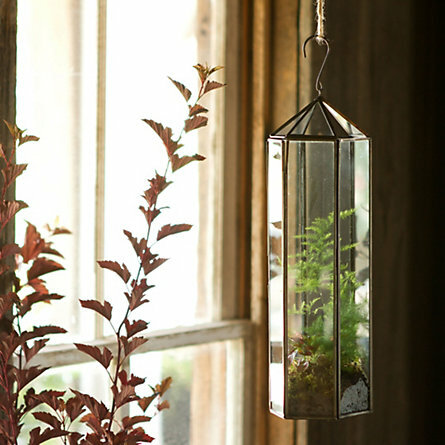 With gorgeous metal and glass construction, this terrarium is always the center of attention, even when filled with a simple display of moss and ferns! Photographs and Text ⓒ Michaela Medina/The Gardener’s Eden. All photos, articles and content on this site (with photos 2, 3 & 4, noted exceptions from Terrain) are the original, copyrighted property of The Gardener’s Eden and may not be reposted, reproduced or used in any way without prior written consent. Contact information is in the left side bar. Thank you! The Allure of Moisture – Mist and Water Droplets Inside a Garden Beneath Glass. Nephrolepis cordifolia ‘Duffii’ and Begonia ‘Trade Winds’ with Sphagnum moss and Ceramic Ornament in an Apothecary Jar. We are expecting a bit of snow this afternoon in Vermont. Nothing major is predicted by way of accumulation, but there will likely be a blanket of white covering the ground tomorrow morning. I love snow, but there’s a long, cold season ahead of us, and I know that soon I will begin pining for the smell of moist, fresh earth. Already my skin and hair are crying out for lotions and potions. Of course, I’m not the only one craving moisture. Many of my houseplants prefer humid conditions, and in a dry house heated with a wood-burning stove, it’s difficult to meet their requirements. 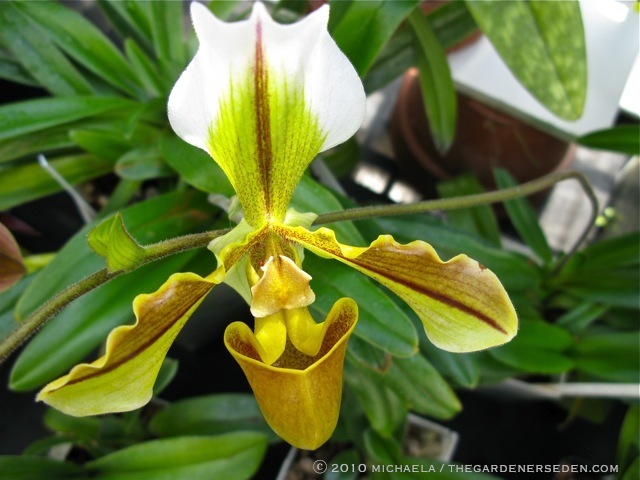 I count Orchids (like this gorgeous Paphiopedilum hybrid) among my most favorite plants! 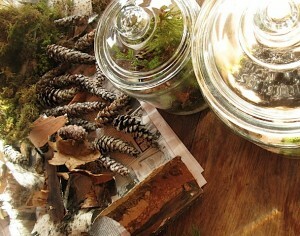 One of my favorite winter activities is terrarium making. I love to create and maintain beautiful gardens beneath glass. 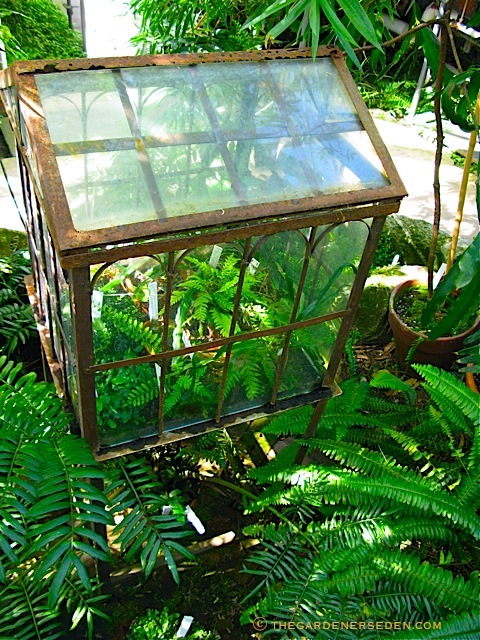 Many plants love the humid micro-climate provided by an enclosed terrarium, including some of my favorites: begonias, ferns, ivy, moss, orchids, and violets. And because they are relatively easy to care for, I often give terrariums as gifts. 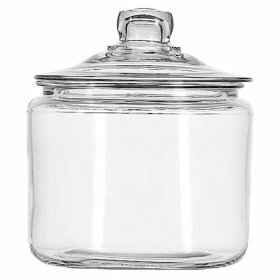 Over all, a simple Wardian case or glass jar terrarium is the perfect indoor container garden for someone new to horticulture. Of course most living things have needs, and a bit of care is required in order to keep all plants, including those enclosed inside a terrarium, healthy and beautiful. However, if you carefully construct your garden-beneath-glass —click here for a tutorial— you can avoid many of the more common pitfalls (stagnation, rot, fungal/bacterial infections and/or insect infestations). Peperomia make excellent terrarium plants. This Peperomia griseo-argentea (Ivy Peperomia) would provides a lovely color-contrast amongst darker leaved species, in a larger-sized terrarium. It can be found and purchased at Glasshouse Works online here. Choose your plants carefully. Be sure to consider the mature size of each species and cultivar you place in your terrarium; especially if you are working within a small apothecary jar or glass cloche. Look up plants online, or consult a knowledgable greenhouse grower to be sure you have the correct information about your plants’ requirements and mature size. Always purchase terrarium plants from a reputable grower. 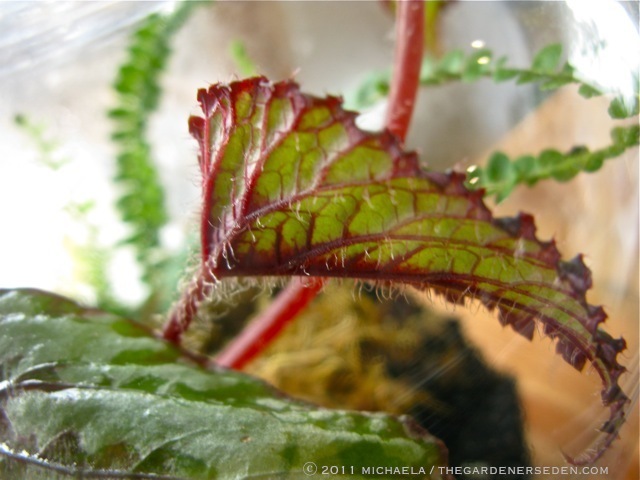 If you aren’t certain of your plants’ history, it’s best to quarantine new specimens and monitor them for pests and disease before introducing them to a terrarium. 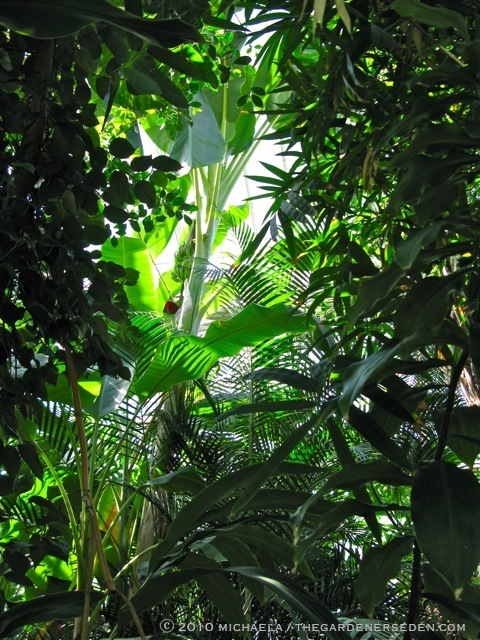 Visiting greenhouses —like the Lyman Conservatory at Smith College, a tiny section of which is pictured here— is a great way to learn more about horticulture. 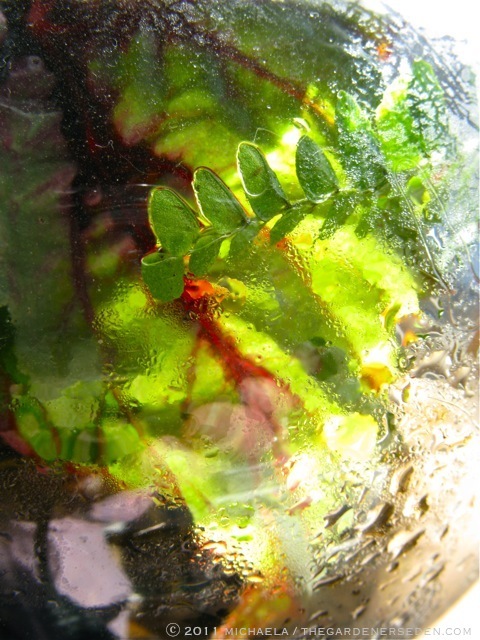 It’s also a fantastic place to get ideas and information about growing plants beneath glass! 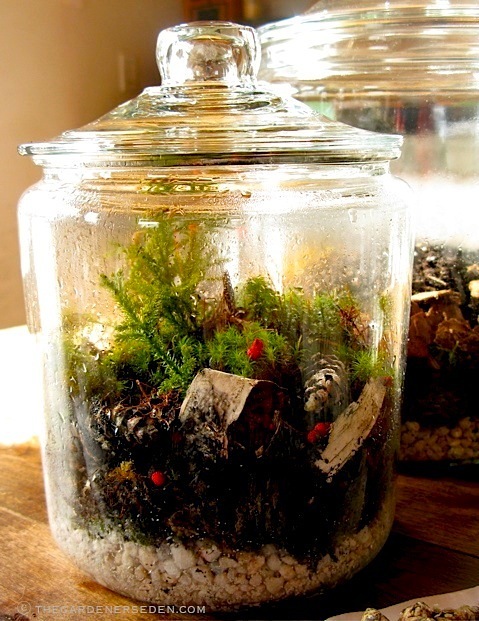 If the soil in your terrarium is properly watered at the time of planting, and specimens are housed in a fully enclosed container —such as a Wardian case or apothecary jar— then your terrarium may not need additional moisture for months. 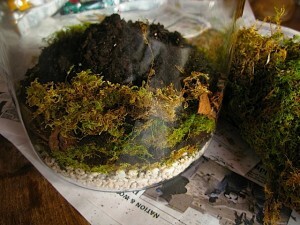 But if your terrarium is partially open, you will need to monitor the soil’s moisture level more carefully. Gardens surrounded by glass should be checked regularly to insure that the soil remains moist, but never soggy. The riskiest season for terrariums tends to be summer, when it tends to be hotter and brighter indoors. Some plants prefer low-light rooms. 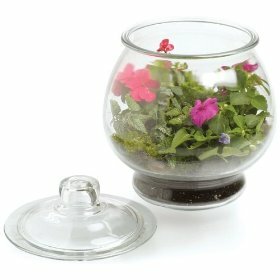 For more information about this open-terrarium, click here. The best location for most terrariums is a warm, indoor spot with indirect light. If you choose to fill your terrarium with plants that require bright light, then your terrarium may be situated closer to windows. But keep in mind that containers located in bright, sunny spots or near heat-sources should be checked regularly for proper moisture. 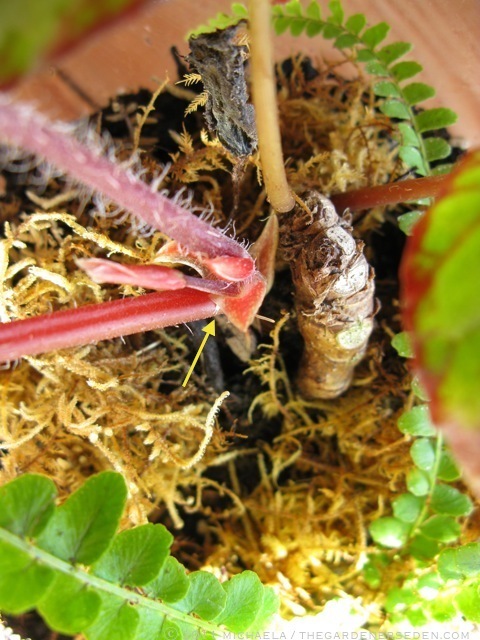 Most enclosed-terrarium plants prefer low-light conditions. 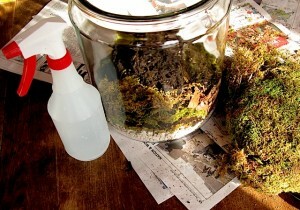 Cases and jars containing ferns, moss, and other forest-floor plants can be located in dimly lit rooms (see an example of a low-light terrarium here). If the container receives uneven light, occasionally rotate your terrarium in order to prevent lopsided growth. Think of your terrarium as a tiny conservatory, and tend to its maintenance with as much love as you would any other garden in your care. 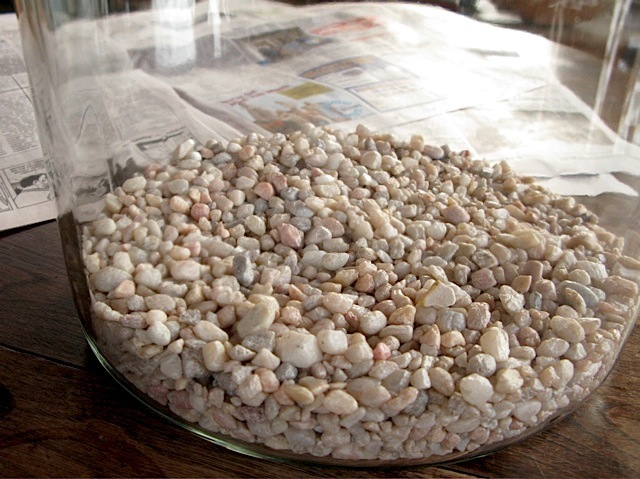 Although fertilizing most terrarium plants is unnecessary, it’s important that you groom and maintain your plants as you would in any other garden. Keep things tidy inside and out by cleaning the glass and picking out debris. Remove spent flowers and yellow, withered leaves with scissors or tweezers, and prune plants when necessary to maintain attractive shape. If one or more of the plants becomes too large for a small terrarium, remove it and place it in a larger case or container. And if a plant should begin to fail, or die, extract it immediately to avoid the spread of disease. Not sure of how to identify insects or what to look for in terms of disease? The books I mentioned in my previous post (below) can help with the general care of houseplants the very-useful, What’s Wrong With My Plant? will provide even more help with troubleshooting horticultural problems indoors and out. Of course, even the most cautious gardener occasionally runs into terrarium troubles. 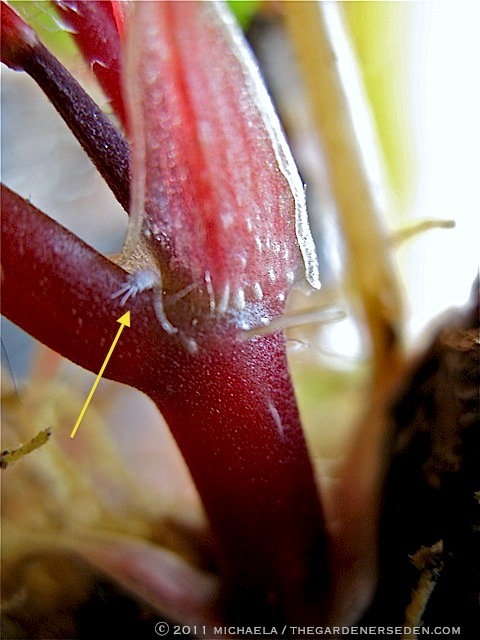 Sometimes, tiny insect eggs, microscopic bacteria and mold spores will escape detection and —unless you monitor the plants on a regular basis— develop into serious problems. At the first sign of trouble, attack insects and diseases by either treating or carefully removing the infected specimen. If your terrarium is large enough, insecticidal soap, horticultural oils and other treatments may be applied directly to the plants contained within, but in most cases, the safest and best course of action is to remove the plant. Here’s a closer look at the mealy bug on my Begonia. So long, pal. It’s time to say goodbye with a good hit of insecticidal soap! I’ll be back to treat your kin to another soapy bath later! I will be writing more about terrariums and indoor container gardening —including design, planting and care— over the coming weeks. For more ideas, posts, resources, links and information, visit the Indoor Eden page. 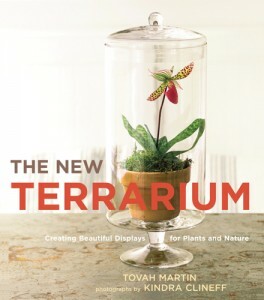 In addition, Tovah Martin’s The New Terrarium is both an inspirational and useful resource for terrarium design, construction and maintenance. I own and highly recommend this beautifully photographed, well-written book. Nephrolepis cordifolia ‘Duffii’ and Begonia ‘Trade Winds’ with Sphagnum moss and Ceramic Ornament in an Apothecary Jar. Terrain is a great online source for terrarium supplies and beautiful, artistic containers.Click here or their image above to visit their website. 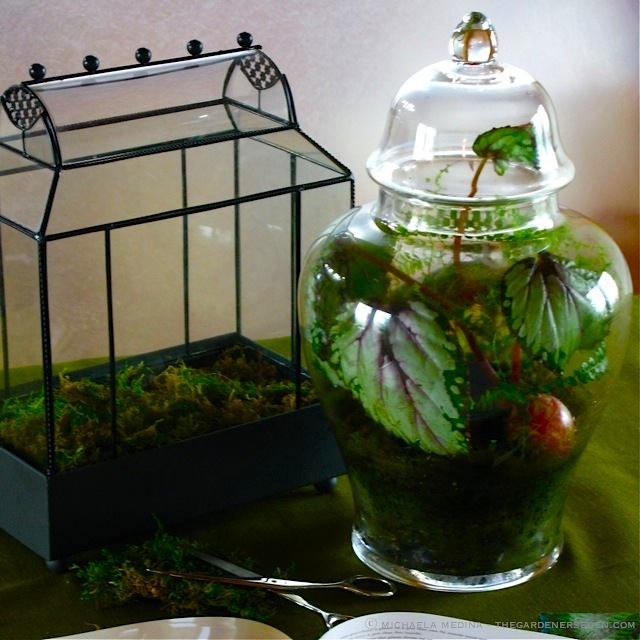 Find more indoor garden and terrarium ideas on the Indoor Eden page. 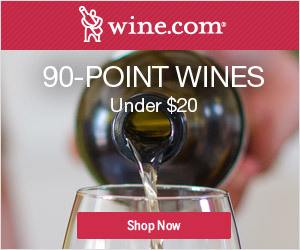 Or visit the retailers linked below – all are known for fine garden products and terrariums. Article and Photographs (with noted exception) ⓒ Michaela at The Gardener’s Eden. All content on this site (with noted exceptions) is the property of The Gardener’s Eden Online Journal, and may not be reproduced without written consent. Thank you! Grey. Grey. Grey. Today the sky is one big, dull, expanse of monochromatic ash. On days like this, with thick, low clouds and no sunshine to be found, low-light rooms inside the house can seem particularly dark. Even the sunniest of homes usually have a few shadowy spaces, and although the hard metal finishes in modern bathrooms, and cool-colored interior walls may sparkle on sunny days, in the dead-of winter, this kind of decor can leave you cold. These gloomy spots always seem to benefit from a splash of lush, verdant color. Houseplants can add natural warmth to indoor spaces, particularly those with modern, minimalist designs. Sleek materials, like stainless steel and glass, are easily enlivened with a touch of green foliage. True, dark rooms can be a challenge for indoor gardening – cactus, herbs and succulents will wither in dank spaces. But filtered light will support many beautiful foliage plants, such as ferns and moss, and a few blooming tropicals, (including African violets, begonias and orchids). 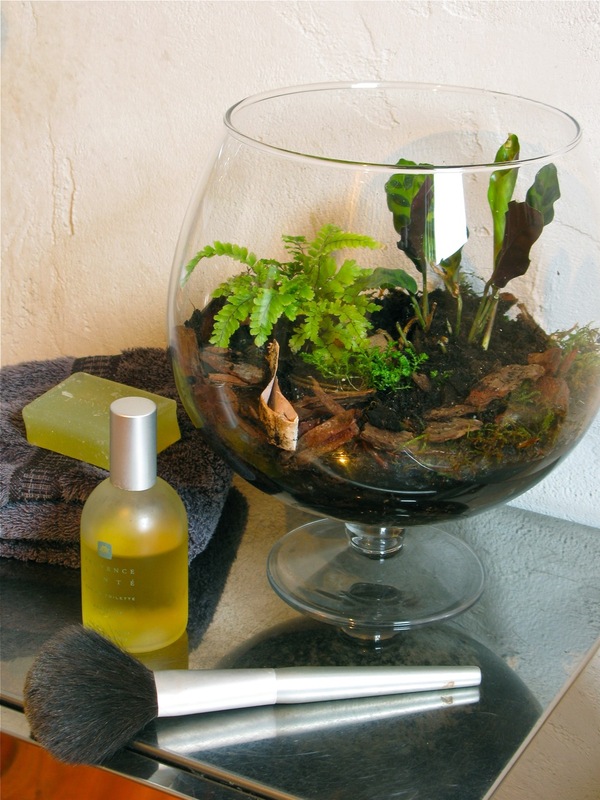 Terrariums are a great way to display rainforest tropicals and shade loving plants of all kinds. Humidity tends to be higher in bathrooms, making this room the perfect place for moisture-seeking plants. My tiny first-floor powder room was looking particularly gloomy last week, so I put together an open terrarium in a glass-pedestal bowl. This wasn’t an expensive project, in fact the total cost, including both plants and glass bowl, came to $16. This terrarium, (pictured in my bathroom in the photo at top), includes maidenhair fern, (Adiantum), calathea, (C. lanceolata), and club moss, (Selanginella kraussiana), all purchased from The Old Schoolhouse Plantery, just down the road. I love how this tiny bowl completely changes the mood of my metallic little space. Over the holidays, I made a low-light terrarium gift for my sister, (pictured below). This large, thick-glass bowl is filled with an African violet, (Saintpaulia), club moss, (Selanginella kraussiana), and a beautiful begonia called ‘Kit Kat’. I added a clear glitter ball, (from Michael’s craft store), for a bit of sparkle. My sister lives in an old New England home, with many dark, interior rooms. Low-light plants like begonias thrive in these conditions. However, wood-stoves and dry heating-systems can make for a challenging house-plant environment. This is where terrariums come in particularly handy. 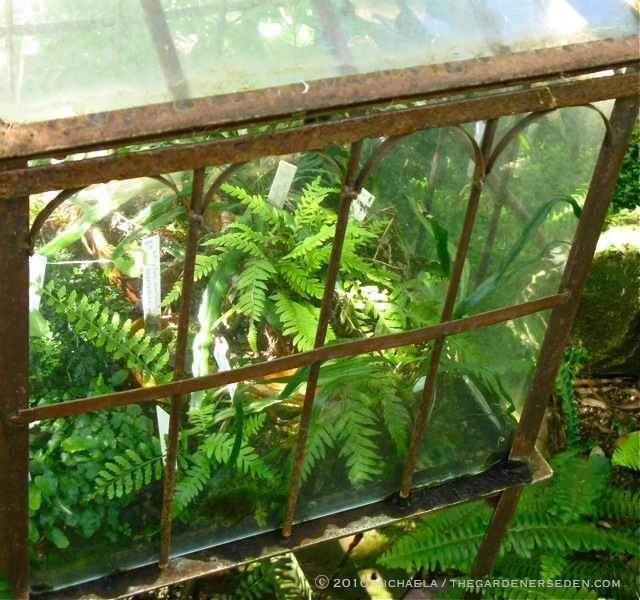 Glass-houses, even tiny ones, hold moisture and increase the humidity in the terrarium’s micro-climate. Although open-bowl planters require more attention than closed, cloche-style or Wardian case terrariums, they have a few advantages. 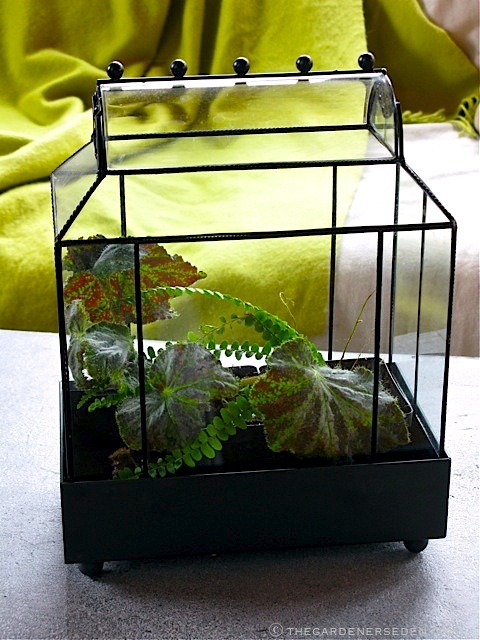 Begonias, and certain other plants, can sometimes suffer from mold in an excessively moist, closed terrarium. Since my sister has a new baby to care for, I wanted to give her a relatively easy-to-care for gift. We’ll check in to see how she rates it in a few more weeks. When designing indoor containers for dimly-lit room, it helps to pay attention to foliage texture and pattern. Try to select a few different textures; combining smooth, lacey, velvety, and/or hairy leaves for contrast. Also have a look at leaf-pattern. To my eye, leaves can be even more spectacular than bloom. Colored veining, bold stripes and splotches, and tonal variation are all things to look for in plants. 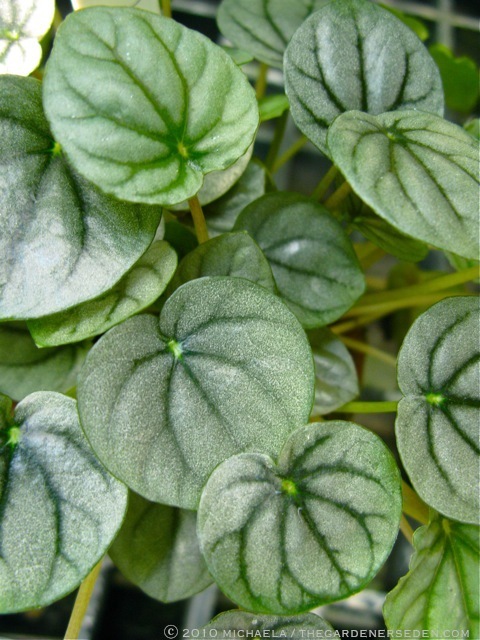 Begonia, viola, peperomia, calathea and pilea are all easy to come by in greenhouses, and offer a wide range of foliage color and texture. 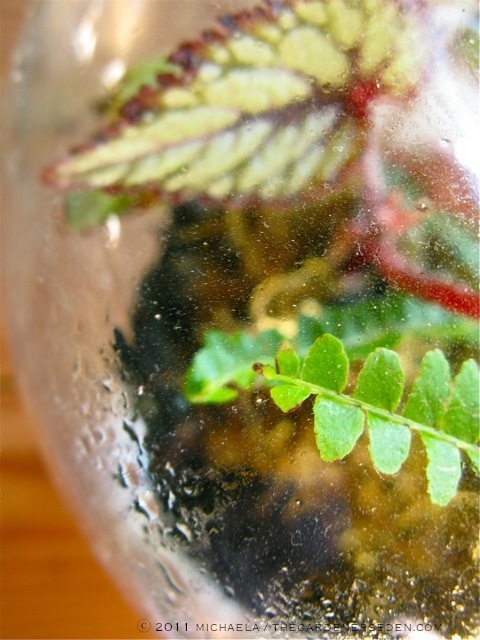 I like to use ferns to lighten-up the look of a terrarium, (particularly the maidenhair ferns), and mosses of all kinds add a velvety touch to a glass container. Glass balls, mirrors, prisms and other sparkly details can also help to catch light and reflect color in a dark space. Begin by letting your imagination run wild. 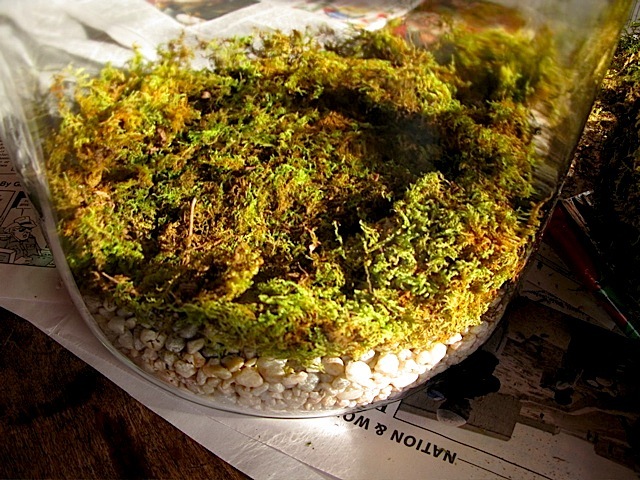 There are as many kinds of terrariums as there are people creating them. 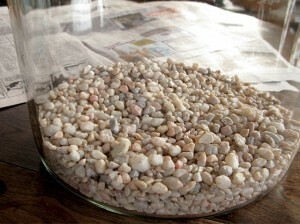 Terrariums may be open or closed, short and wide or tall and narrow. They may be made of solid glass, acrylic or plastic, or they can be combined with other materials, such as wood or steel. Some tiny greenhouses are smaller than lemons; others take up entire rooms. I have seen absolutely stunning, miniature conservatories made from recycled or even antique glass containers, and I have been amazed by more modern, architectural terrariums constructed from sheets of clear acrylic. Some designers like to add tiny collectibles, such as doll furniture or figurines to their designs. Other creative adornments might include itty-bitty flower pots, toy cars, prisms or glass balls. It is endless. The plants contained within terrariums also vary wildly. Naturally, your choices are limited by a wide variety of situational conditions and circumstances; including plant availability, budget, design, mature specimen size in relation to container, as well as ease of maintenance. There are also cultural requirements to consider; a few of which include humidity preferences, drainage and soil structure and chemistry. Many plants will thrive within a moist, humid terrarium environment. 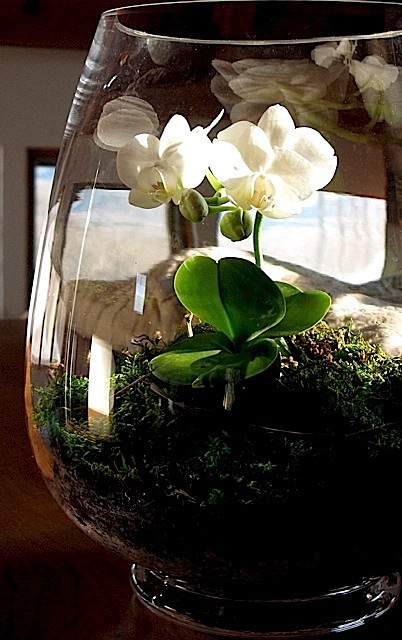 In fact some, including many of my favorite orchids, actually perform better in my dry, winter home when contained within glass. The tiny moth orchid, (Phalaeonopsis), pictured at the top of this post, ($9 at Home Depot), is happily growing in a mixture of bark and sphagnum moss. Drainage is provided by a mix of pea stone and charcoal at the bottom of the container. Phalaeonopsis thrive in warm, moist conditions. 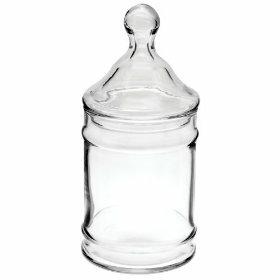 Elevated humidity is provided by a tall, wide glass vase, (found at Target for $12), which holds water and reduces evaporation. On the other hand many plants, including most alpines, cacti, succulents and herbs, tend to wither and rot in low light and dampness. But given the right container and growing conditions, some of these plants may be grown in glass planters as well. 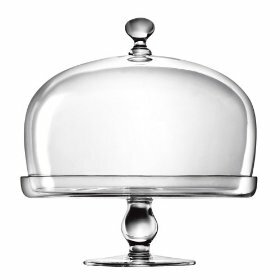 Of course, more exacting personalities might argue that wide-mouthed, glass pedestal bowls do not technically qualify as a terrariums. I encourage you to expand on these old-fashioned definitions, and to explore the concept of the modern terrarium. 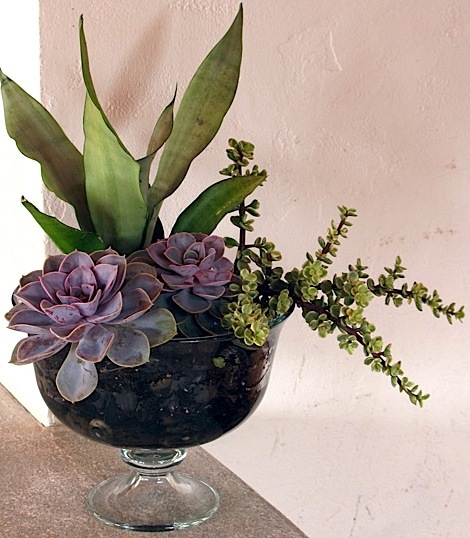 Although succulents are not good candidates for closed conservatories, they do make fantastic additions to open glass bowls – particularly the urn-shaped vessels intended for candy and fruit display…. I created a lovely succulent bowl, similar to the one above, to give as a holiday gift this year. I liked it so much that I ended up making this one for myself. 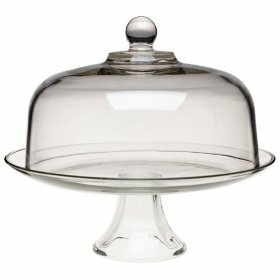 I selected a glass pedestal bowl intended for fruit display, ($9 at Target), and lined the bottom and sides with polished black stone, both for practical drainage and decorative drama. The center well was slowly filled with a good potting mix and plants. 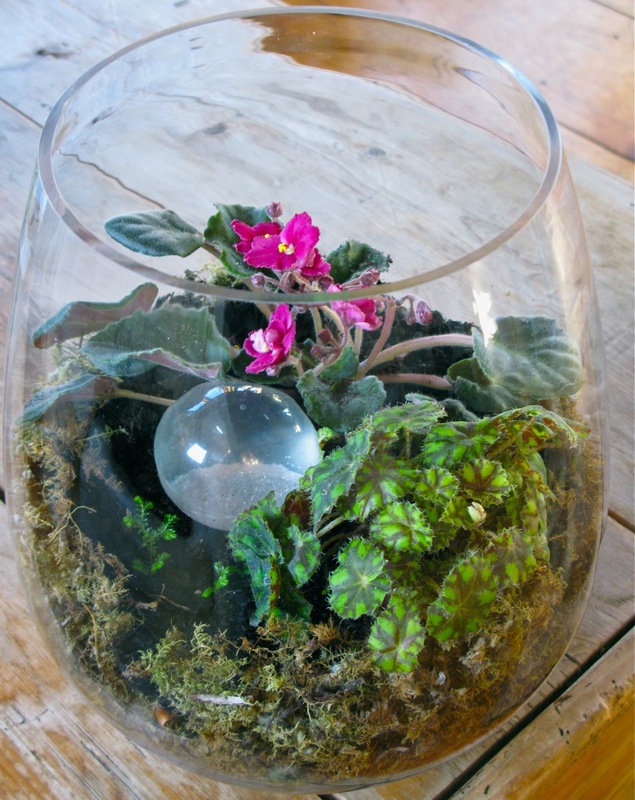 Designing a terrarium or glass planter is no different from any other garden design project. Color, texture, shape, structural density and form always come into play when designing with plants. I wanted to make this classic shaped bowl a bit modern. Many succulents have bold, geometric shapes, so they seemed like the perfect choice. I love the contrast of these thick-fleshed, colorful plants against the clear, delicate glass. For my vertical element I chose stately snake plant, (Sanseveria trifasiata ‘Laurentii’), and for the mounded, central feature, I chose one large and another small Mexian rose, (Echeveria ‘Pearl’). The trio of plants is softened by the trailing, delicate beauty of variegated elephant bush, (Portulacaria afra variegata). Perhaps stalwarts of terrarium design will brush this combination off as merely a conventional planting. But I think this modern terrarium-hybrid lies somewhere between, and defies hard-line definitions. Of course, before you begin assembling your glass container plantings, there are a few things to keep in mind. Knowing something about your plant’s natural environment and cultural preference is the key to horticultural success under any circumstances. You can find this information by looking the plant up online or in an encyclopedia, (see library page for good reference books). If you provide a plant with what it wants and needs, odds are much better that it will reward you with lasting beauty and long life. But remember that half the fun of gardening, inside or out, is experimentation. This is an art as well as a science, so have fun and be creative. If your plantings start to look a bit lack-luster, you can always re-configure your arrangements and/or swap containers. I move plants around all the time! I will be back with more terrarium resources, tips and ideas, as well as other indoor gardening projects soon. In the meantime, some great ideas for terrariums and indoor-plants may be found in Tova Martin’s fabulous new book The New Terrarium: Creating Beautiful Displays for Plants and Nature, and/or Diana Yakeley’s beautifully photographed title, Indoor Gardening. Together with a gift certificate from a local greenhouse, either of these books would make an unexpected, much appreciated gift for novice and expert gardeners alike. You are currently browsing entries tagged with Indoor Gardening with Terrariums at The Gardener's Eden.